A selection of hand finished Sterling Silver Love rings / Wedding bands celebrating the language of love translated into ancient scripts and symbols and the classical and contemporary word. 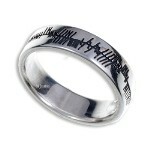 Sterling Silver love ring with Cornish Celtic language inscription around the circumference. Supplied in a satin-lined gift box. During the 12th century the Cornish knight, Tristan, defeated the Irish knight, Morholt, to bring the fair Iseult home for his uncle, King Mark, to marry. On the journey back to Cornwall, after ingesting a love potion, Tristan and Iseult fell madly in love. 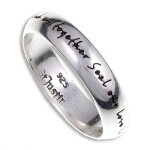 Their complete devotion to each other is symbolised by the Cornish love script around this ring. 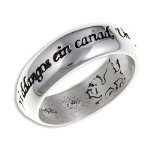 Sterling Silver love ring with an English language inscription around the outer circumference. Supplied in a satin-lined gift box. 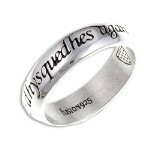 Both the design and inscription on these rings make them ideally suited as timeless Wedding Bands. Back in the 16th Century William Shakespeare wrote what is arguably the greatest love story of all time Romeo and Juliet. Llywelyn Fawr (1194-1240) was descended from Lady Godiva and fell in love with and later married Joan, the daughter of King John of England, in 1206. He was one of the most memorable Princes of Wales and the Welsh love ring epitomises the love between these two people in their struggle to ward off the invasions from England. Sterling Silver love ring in a flat design with an inscription around the circumference. Supplied in a satin-lined gift box. The alphabetic code of the oghams was created, according to legend, by Ogma (Celtic God Ogmios), God of knowledge. By exchanging rings a couple symbolically declare their eternal love for each other and become bonded in a lifelong commitment.